Founded by Joe Saba in 1965, SABA is guided by the principles of improvement + innovation, drawing its strength from this country’s vibrant cities and innovative architecture and design. The SABA philosophy is upheld in the beauty of their lines & the confidence of their cuts which means that every garment is infused with the integrity and passion of the SABA name. Because of their large loyalty program, SABA wanted to make sure that their customers were well looked after and made the experience as seamless as possible. That means that on login, VIP customers are shown automatic price markdowns and offers that are exclusive to members, rather than having to wait until adding their loyalty number at the checkout to see how much each garment might cost. SABA wanted to take their look books to the next level and also leverage stunning imagery that is created as part of each season’s campaign. This has resulted in look books that feature a combination of images, .gifs and video that makes every look stoppable, every season. In order to create the most convenient shopping experience possible, SABA implemented Click & Collect based on strong customer feedback for more convenient online shopping options. 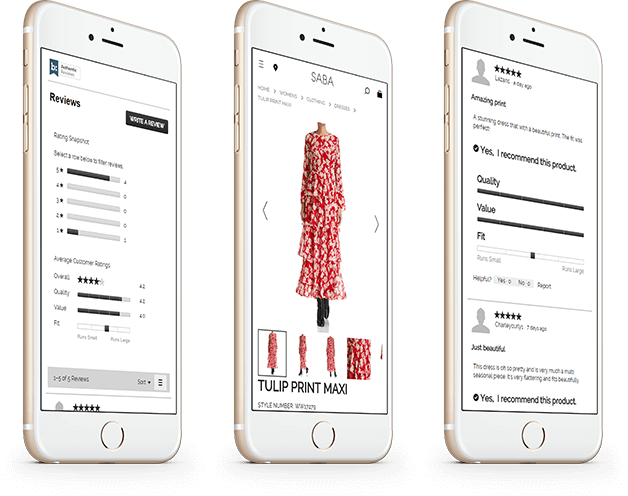 This implementation allows SABA to leverage in-store stock, enable customers to pick up their orders within 3hrs and incorporate an in-store experience into every purchase. Customer feedback can be one of the most important tools for both the customer and the SABA team. By implementing comprehensive customer reviews that include feedback on sizing, fit, quality & value as well as customer images. The power of social proof has long been documented as a path to purchase online and SABA are always looking for ways to give customers a voice and open channels of communication between other customers and the brand. 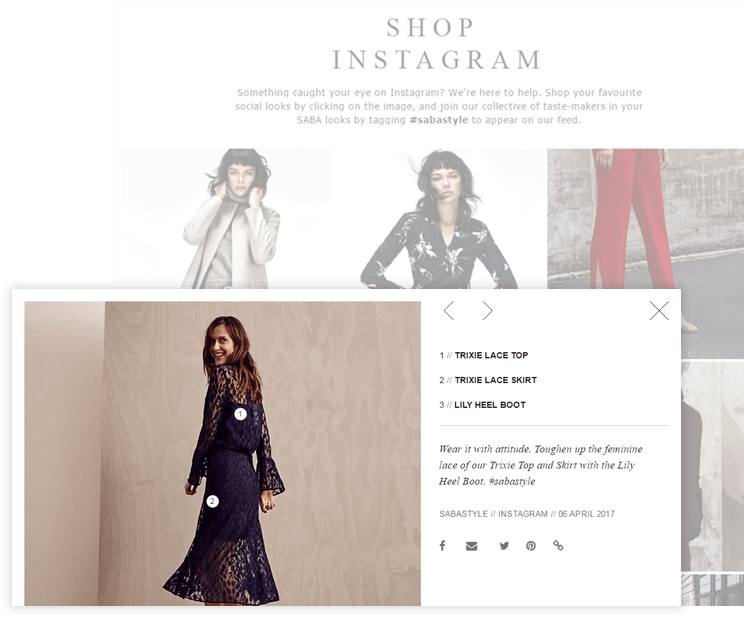 Shoppable Instagram feeds allow the customer to shop the look and allow the brand to leverage unique content from social channels to make product sales and enrich the brand experience. With a diverse age demographic, we aim to continue to support the traditional shopper as they most certainly branch out into the digital world. With this in mind, we aim to give our customers a single shopping experience, regardless how they interact with us.